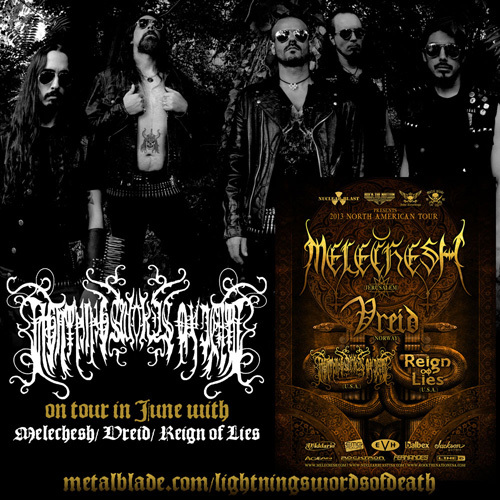 LIGHTNING SWORDS OF DEATH announces tour with Melechesh! LA-based black metal artists, LIGHTNING SWORDS OF DEATH, are emerging for a North American tour this June. They will be supporting Melechesh alongside Vreid and Reign of Lies. The tour begins on June 16th in LA at The Joint and will wrap up on June 30th in Brooklyn, NY. LIGHTNING SWORDS OF DEATH’s “caustic yet otherworldly approach” (Decibel Magazine) has earned the band high praise from fans and press worldwide with their most recent album, Baphometic Chaosium. The band also recently released their first ever music video. The video for Baphometic Chaosium and was directed by co-founder and lead vocalist, Autarch (aka the metal illustrator, Farron Loathing). The project, which also marks Autarch’s directorial debut, is the result of a partnership between Farron Loathing and Mortichrome Films. It is described by its creator as “a psycho-dramatic interpretation of the Mass of Chaos and the invocation of Baphomet as performed by a collective of ritual performance artists.” Watch the video now at metalblade.com/lightningswordsofdeath.